The strength of the manufacturing sector is fundamental to the overall economic performance of Illinois and the U.S. as a whole. The manufacturing sector in Illinois create large numbers of jobs that pay high wages to workers, purchases more goods and services from within the state than any other sector, and constitutes a main component of the state export economy. For these and other reasons, manufacturing needs be at the center of all government discussions on economic policy. 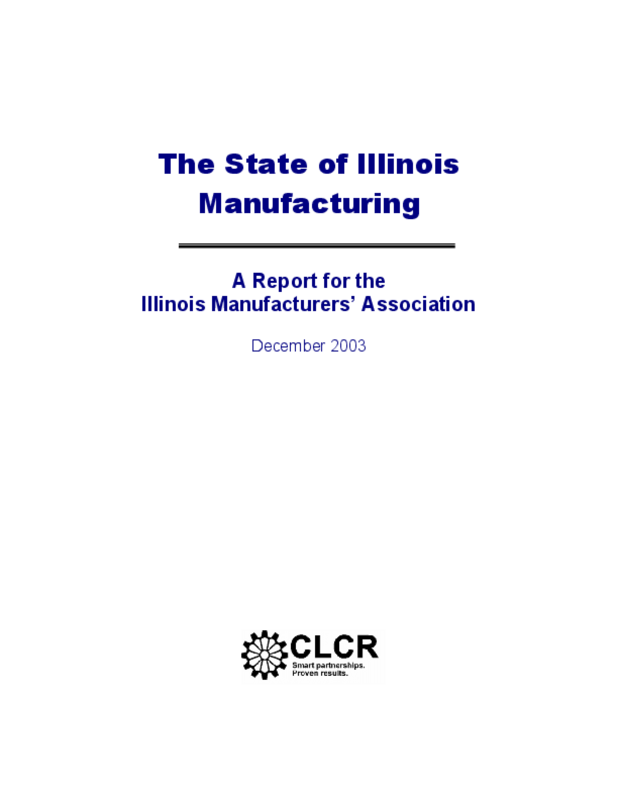 The Center for Labor and Community Research (CLCR) was commissioned by the Illinois Manufacturers' Association to analyze the condition of the Illinois manufacturing sector. We found that Illinois manufacturing is essential to Illinois' economy, and although it is among the top manufacturing states in the country, it faces a number of challenges. This report demonstrates why and how Illinois manufacturing matters, explains the current challenges it faces, and recommends actions to overcome some of these challenges. In addition to looking at manufacturing as a whole, this report looks at four key manufacturing sectors, or clusters, that together account for 64% of manufacturing employment in the state. These are the metals, electrical, printing, and food manufacturing sectors. Manufacturing is vital to the state's economy and workers. Manufacturing exports create significant employment opportunities in Illinois, and the state's manufacturing workers are the most productive in the nation by far. Like other U.S. states, Illinois faces increasing competition from low-wage producers in the developing world as well as from highly skilled producers in developed countries. In order to remain competitive into the future, the sector requires increased investments in its infrastructure and workers and an improved workforce development system in order to increase the value-added component of their products. The Illinois manufacturing sector needs a "High Road" partnership with government and labor to increase investment in infrastructure and workforce development, to support the sector by creating specialized service centers that provide assistance to Illinois companies, and to effectively using public subsidies to reward and assist those companies that are pursuing High Road strategies of innovation and development. Copyright 2003 Center for Labor & Community Research. All rights reserved.